My four-year-old son gently placed our menorah in the front window last week. He climbed onto the window seat, centered its heavy silver arms squarely against the glass, and hopped back down. “Look Mommy, it’s ready for candles! 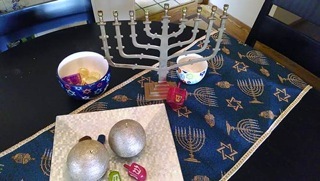 There’s the Shamash!” On a menorah, the center candle is called the Shamash. It’s the “helper” candle, the one that we use to light all of the other candles each night. 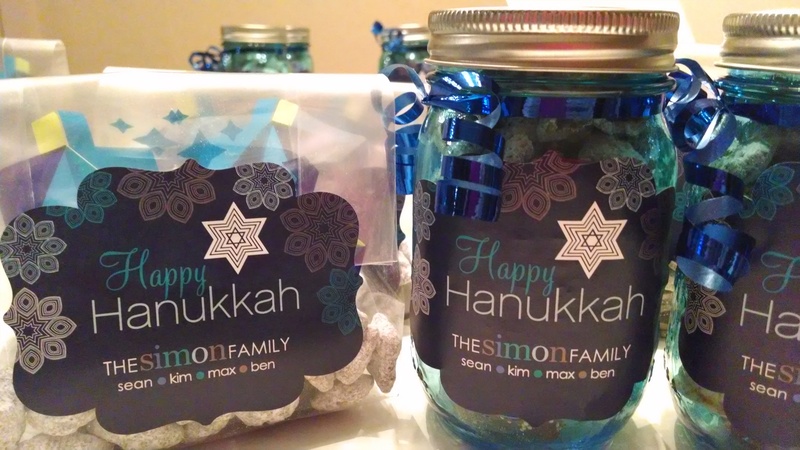 In Max’s preschool classroom, one child each week gets to be the Shamash, or the special helper. It’s a privilege that all of the four-year-olds look forward to, and I loved watching Max have his turn to shine this year. Max has suddenly grown into a helper. He is my Shamash. He drags the laundry basket from room to room, collecting the dirty clothes. He finds a toy for his baby brother to play with, while I’m cooking dinner. This year, more than any other year, he has left babyhood behind. He has changed so much from the little boy who couldn’t even pronounce “menorah” last December. 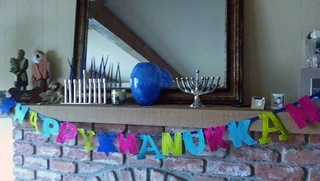 Now, he is guiding me as I hang our felt “Happy Chanukah” sign along the fireplace mantle. 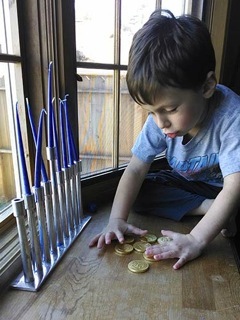 He fills large plastic dreidels with chocolate gelt, and watches intently as I chip last year’s melted blue wax out of each candle holder. This year, instead of decorating while Max was asleep, I asked him to help me unpack each box. He was careful with the long, delicate candles. 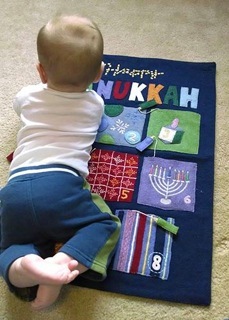 His skinny arms were strong enough to lift the heavy menorah out and put it in its place. Instead of surprising him with presents that we think he’ll like, he painstakingly writes everything down on his Chanukah list. “Mommy, how do you spell Finn McMissile?” he asks. “Umm…. what does an F look like?” I love watching him look forward to all of the special traditions that we have. He is old enough to remember them now. Old enough to get excited about sharing our holiday with Baubee (my mom), and with his friends. This year we are in a new house, and my heart aches a little when I step back in our living room to try to figure out where each sparkly dreidel and bright blue hand towel will go. Our new house didn’t feel complete until everything was in its place, and yet I’m saddened by knowing that Max’s memories of years past will fade. Still, there is beauty in change. This year, our Baby Bennie is here. This year, he will join us by the glow of our menorah. There will be special presents just for him, and he’ll wear the silly Chanukah jammies that used to belong to his big brother. And some things will always be the same. My mom and my husband, side by side in the kitchen making latkes. Oil splashing everywhere as they cook, and a little boy who doesn’t eat much, but loves the special treats that only Chanukah brings. 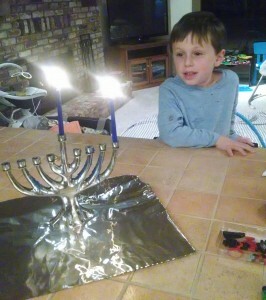 It fills me with pride to listen as Max sings the Chanukah song. December reminds me of why we have chosen a Jewish preschool, and how nice it is to be surrounded by a community that understands that we must carve out our own slice of holiday cheer. When our menorah takes up residence in our front window, we are announcing to our new neighborhood that we are Jews. We are celebrating that a great miracle happened here. Chanukah in our house feels quiet, and peaceful, and personal. It is a time to reflect on the blessings of a year that sped by too quickly. The growth of our family, the new beginnings, the opportunity to remember what matters most. My Shamash, my sweet big boy, becomes our memory-keeper. We roll dough for Chanukah cookies, and press star shapes into floured wax paper. Just as my mother did with me. Our voices join in the Chanukah prayer as we light the candles. The words rise up and meet the tiny flames, announcing to the world that we are a family united in faith. 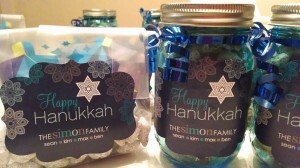 A family celebrating the beauty of Chanukah together. May your miracles be sweet this holiday season, and may the light of your faith shine bright. This post is part of the Favorite Holiday Traditions series, sponsored by Betty Crocker Cookies. I love including younger and new family members in traditions. Many holiday traditions are thousands of years old, to be a part of that chain gives me pause. Happy Chanukah!